Everybody has this wrong – Trump is not bluffing and he is not Netanyahu’s puppet. What has really happened here is that Xi, Trump, and Putin agreed over a year ago to take down the Deep State. The denuclearization of Korea, combined with the destruction of the old banking order, will be followed by the denuclearization of Israel and the restoration of Palestine. We are at the beginning of a 1,000 year period of peace and prosperity for all. Chinese airfields in the Tibet Autonomous Region (TAR) that face India are being upgraded, security agencies have told South Block. South Block houses the Prime Minister's Office as well as the defence and foreign ministries. Importantly, security agencies have warned that "permanent hangers" too are being built in these airstrips. Permanent hangers or "blast pens" which protect aircraft on ground during an air raid are crucial in times of war for fighter operations. Senior defence ministry officials told India Today TV the airfields being upgraded include Hotan, Hoping and Lhasa -- the capital of Tibet. Permanent hangers are coming up in the Hoping airfield, security agencies have warned. The airstrip in Lhasa is being extended, "the construction will be completed soon", security agencies have told the government. As strategic equations in the Korean Peninsula undergo a dramatic shift, India too has decided to enter the fray. 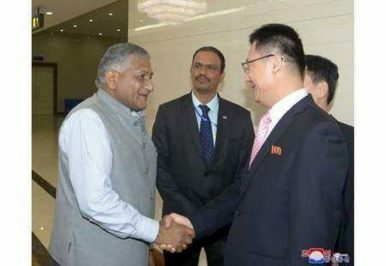 Last week, India’s Minister of State for External Affairs General V K Singh paid a two-day visit to North Korea. This first ministerial visit from India to North Korea in nearly two decades was at the invitation of the North Korean government, but comes at a time when developments in the region have the potential to bring in a fundamental realignment in the balance of power. Given New Delhi’s longstanding concern regarding the role of Pakistan in helping North Korea develop its nuclear and missile programs, India during Gen. Singh’s visit underlined “the threat from nuclear proliferation, in particular India’s concerns in the context of the proliferation linkages with India’s neighborhood.” In return, Pyongyang reassured New Delhi that “as a friendly country DPRK will never allow any action that would create concerns for India’s security.” The two nations not only explored cooperation in areas such as vocational education, agriculture, pharmaceuticals, promotion of Yoga and traditional medicine, but also decided to enhance people-to-people linkages to mark 45 years of diplomatic relations. The Trump administration's revamped Afghanistan strategy has made little progress against the Taliban insurgency, leaving the country a "dangerous and volatile" place nearly 17 years after the U.S. invaded, a government watchdog report said Monday. 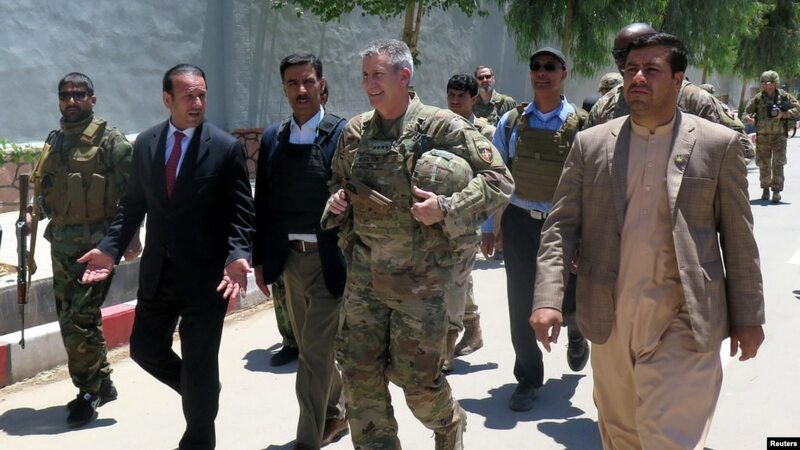 The conclusion contrasts with assertions last fall by the American military that the Afghans, with U.S. support, had "turned the corner" and captured momentum against the Taliban, which it called fractured and desperate. The report to Congress by inspectors general of the Pentagon, the State Department and the U.S. Agency for International Development also cast doubt on the administration's decision to send a new set of military advisers this year to work with Afghan forces closer to the front lines. It said this, combined with stepped-up Afghan offensives, "further raises the risk of civilian casualties, insider attacks, U.S. casualties, and other conflict-related violence." The basmati rice grown in Pakistan’s Punjab province is long and slender-grained. It is aromatic, fluffy when cooked and, in classic Pakistani dishes, pairs well with lentil and gravies made from chickpea flour and spices. At market, it draws double the price, if not more, of non-basmati, long-grain rice varieties. 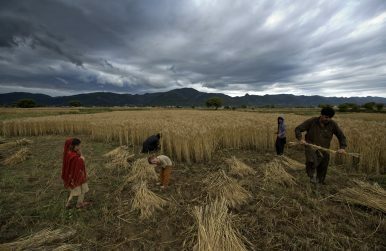 In recent years, however, basmati revenues have slumped in Pakistan amid low-yield harvests and uneven quality. At the Sino-Pakistan Hybrid Rice Research Center in Karachi, Chinese and Pakistani scientists are working to reverse this trend. Using state-of-the-art genetic technologies, they are developing high-yield, high-quality, and pest-resistant rice varieties, for both domestic sale and export. The suspense is over. Two weeks after President Trump ruptured the 2015 nuclear accord with Iran to a chorus of questions about the administration’s “Plan B,” Secretary of State Mike Pompeo yesterday outlined a new U.S. strategy for contending with the persistent challenges posed by the Islamic Republic of Iran. There’s only one problem with the strategy: It’s not a strategy at all, but rather a grab bag of wishful thinking wrapped in a thinly veiled exhortation for regime change in Iran. Actually, there are about a dozen other problems with the strategy that Pompeo articulated—that being the number of benchmarks that the speech laid out as the prerequisites for any “new deal” that he insisted the administration is “ready, willing, and able to negotiate” with Iran. Despite this nod to the possibility of new negotiations, the substance of Pompeo’s remarks forecloses any realistic avenue for diplomacy with or around Iran’s current leadership. And it will exacerbate existing frictions around a variety of diplomatic and trade issues with all of America’s traditional partners. This past week President Trump dropped a hand-grenade on the Joint Comprehensive Plan of Action (JCPOA), leaving European leaders scrambling to keep the deal intact as the United States moves to re-impose unilateral sanctions against Iran. Europe’s leaders must balance the strategic security of keeping Iran’s nuclear program at bay or risk further political fallout with the United States, possibly jeopardizing EU-US business interests. Image A soybean field in Indiana. Selling more commodities like soybeans to the Chinese would make U.S. farmers happy, and reduce the trade deficit, but would not accomplish much more than that.CreditDaniel Acker for The New York Times The Great Sino-American Trade War of 2018 has fizzled, at least for now. Global markets rose Monday after the Trump administration, at least for the time being, backed away from its threat to impose tariffs on Chinese imports. But as negotiations proceed, a big question for the administration remains. Is the goal to make some supporters in farm states and energy extraction industries happy, and shrink the trade deficit temporarily? The improbable turn of events that led to World War I may not have been so consequential were it not for the shifts simultaneously underway in the global order. Today, the dizzying pace of technological advancement and the rapid rate of economic growth in Asia signal another transition in the global order. These factors could amplify the effects of the U.S. withdrawal from the Iran nuclear deal, perhaps paving the way for another international conflict. Facebook Inc. founder Mark Zuckerberg left European Union lawmakers fuming over unanswered questions at the end of a hearing that began with a mea culpa for the company’s recent privacy woes. At a meeting at the EU Parliament, Zuckerberg repeatedwhat he’s been telling every audience recently: that his company didn’t take a broad enough view of its responsibility for user data, fake news and foreign interference in elections and that he is sorry for that. But at a session where lawmakers got to ask all their questions in one go at the start, he annoyed them by batting many of them away -- including on whether people can opt out of advertising and also on whether the U.S. giant is a monopoly that needs to be broken up. This article was first published under the title “Danke, Schweiz” in the Basler Zeitung, a Swiss daily newspaper. Translation by the author. Classical liberal ideas work. But they are usually counterintuitive, and often hard to explain. Proponents of interventionist policies therefore enjoy a natural rhetorical advantage in policy debates. It is therefore helpful for classical liberals if we can point to a practical example, i.e. a country or region which already practices something close enough to our ideas. For British liberals, it is Switzerland which, in many ways, represents such an example. Switzerland is not a libertarian paradise. But it is a country which, through its mere existence and its economic success, refutes a lot of the UK’s conventional wisdoms. While the recent diplomatic rift between Israel and Turkey indicates a further deterioration in relations, the Turkish government has avoided taking concrete steps that could directly hurt Israel, whereas the Israeli response to Turkey's rhetoric was more detrimental and bitter. 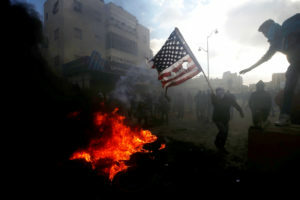 Israeli security forces have killed some 62 Palestinians and wounded scores of civilians by firing during demonstrations held on the Gaza border, which coincided with the opening of the US Embassy in Jerusalem. The carnage drew a harsh denunciation from Turkey’s sworn pro-Palestinian President Recep Tayyip Erdogan. Yet closer scrutiny suggests Erdogan wasn't framing his response for the international community, but rather to appeal to Turkish voters ahead of the June 24 snap elections. There are so few German army helicopters available for the troops that pilots have been forced to train in bright yellow civilian choppers leased from the German Automobile Club. A chronic shortage of spare parts and assorted technical woes have grounded 29 of the Bundeswehr's 130 camouflage-green helicopters. Acute shortages of parts have also left only 39 of the Luftwaffe's 128 Eurofighter jets combat-ready — idled along with nearly half of the armed forces' 224 Leopard tanks and five of its six submarines. No country in the North Atlantic Treaty Organization alliance has savored the "peace dividend" as much as Germany, which slashed military spending in half after the Cold War. And no country in NATO has drawn more criticism from President Trump for not carrying its own military weight than Germany. The new government finally taking shape in Italy is one of the weirdest coalitions you could imagine — and a pretty effective combination if your aim was to sabotage the European Union. Although predictions about where this Italian misadventure is heading are difficult, it could easily be worse than Brexit for the EU. The coalition partners — the left-populist Five Star Movement led by Luigi Di Maio and the right-populist League led by Matteo Salvini — are poles apart in most respects, but come together over immigration, disdain for politics as usual and dislike of the EU. With notable originality, the program they announced last week combines the high-spending ambitions of the left with the low-tax ambitions of the right. This implies a surge of public borrowing. The partners are undaunted by Italy’s current debt burden (130 percent of gross domestic product) and seem to be downright inspired by the EU’s rules on fiscal consolidation. Their program doesn’t just break those rules; it laughs at them. With the National Security Strategy and National Defense Strategy lowering the prioritization of terrorism, the U.S. government will need cost-effective options to continue to diminish the terrorist threat. 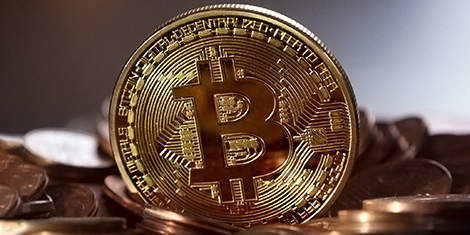 Nonkinetic efforts can be a cost-effective way to reduce terrorist groups’ ability to radicalize, disseminate messages, use the internet, facilitate foreign fighters, fundraise, and exploit poor governance. Undercutting these intertwined terrorist enablers weakens the groups writ large. Despite being preventable and curable, tuberculosis infects more than ten million people each year and is the most common cause of death by an infectious agent in modern times. The international community needs to take five specific actions to eliminate the scourge of TB once and for all. GENEVA – When Mabruka was 18, she came home from school one day and started coughing up blood. She had been feeling sick for about two months, and when she went to a health clinic, she described symptoms such as weight loss, fatigue, shortness of breath, fever, night sweats, chills, loss of appetite, and pain when breathing and coughing. Mabruka was diagnosed with tuberculosis (TB) and prescribed a daily regimen of 9-10 pills. 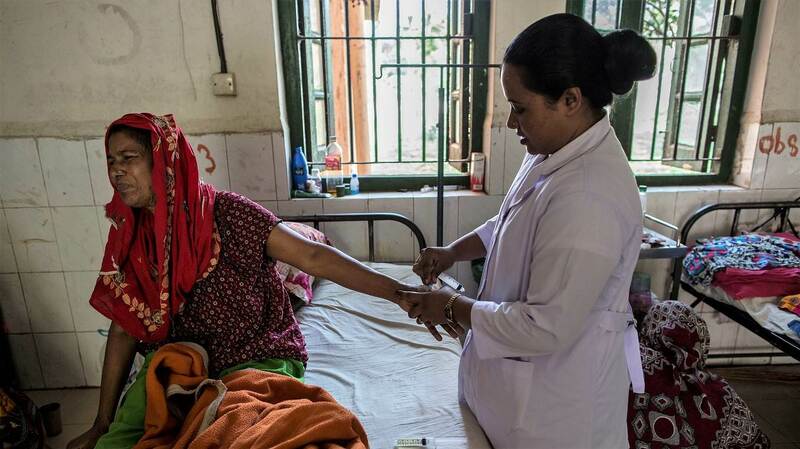 The treatment lasted six months, and during that time she could not attend school. Last week, on Friday, reports emerged that the Chinese People’s Liberation Army-Air Force (PLAAF) had, for the first time, landed an H-6K strategic bomber on one of the country’s South China Sea islands. 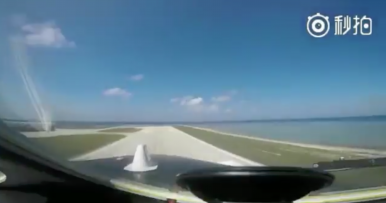 China’s state-run People’s Daily shared footage of the bomber landing on an airstrip. The island in question was Woody Island, China’s largest military outpost in the South China Sea. Woody Island sits in the Paracel Islands, but Chinese military activity there has foreshadowed possible moves in the seven artificial islands that Beijing also possesses in the Spratly group. In addition to permanently stationing military personnel on Woody Island, China has deployed J-11 fighters, HQ-9 surface-to-air missiles, YJ-62 anti-ship cruise missiles, and other materiel there. The Marine Corps is setting in motion plans to shrink the size of the traditional rifle squad, cutting manpower for the Corps’ most basic building block of combat power from 13 Marines down to 12 — a risky move that the Corps admits could fail. 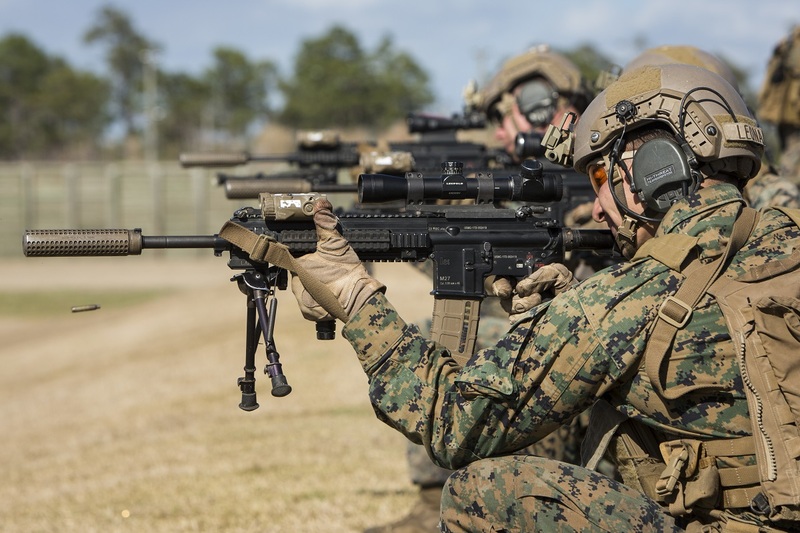 To compensate for the reduced size, Marine Corps officials say the rifle squads will get more lethal weaponry, more responsibilities, better intel and enhanced support from the company and battalion level. Yet the decision to remove a man from the squad adds a level of risk: At the end of the day there will be one less Marine to help carry gear, to return fire, to stand watch or to divide up work. “If someone goes down as a casualty, there will be fewer people who can evacuate the casualty,” one former Marine infantry officer told Marine Corps Times. As Colin Gray said, “If Thucydides, Sun Tzu or Clausewitz didn’t say it, it probably isn’t worth reading.” Clausewitz, Sun Tzu, Thucydides, and their fellow strategic soothsayers, however, are of limited use to leaders charged with employing tactical formations. The battalion commander dutifully keeps her blue-striped white copy of On War from Command and General Staff College, but does the Prussian’s influence extend to her tactical mission? What about her platoon leaders? Fresh out of college, should Clausewitz’s strategic masterpiece rate high on their initial order of merit list? To a field grade officer, Clausewitz has cachet, and his book is ubiquitous. Platoon commanders, though, are less interested in the Prussian than they are in maneuvering their formation to close with and destroy the enemy, and to achieve that end at that level, tactics are king. If Washington doubles down on U.S. military and geopolitical predominance, it risks transforming the emerging competitive era into something far more confrontational and zero-sum than it needs to be. If it hopes to retain its position of leadership, the United States will have to make the present international order truly multilateral.